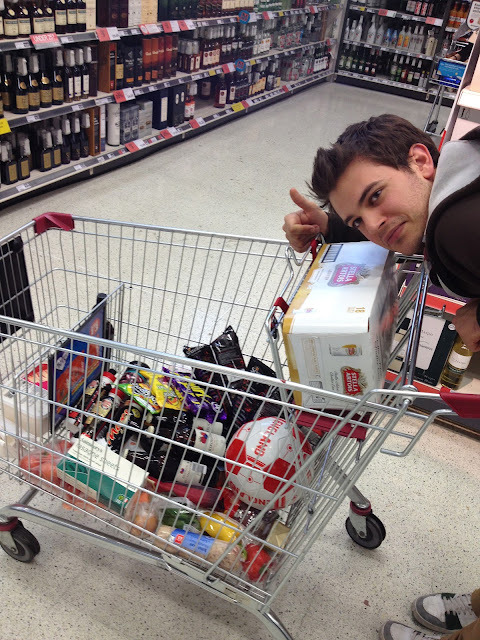 And so a week later, Jake arrived, bringing with him Dave and Kieran, and we headed off to buy all of the necessary (and some arguably unnecessary) ingredients to put together our feast of epic proportions. £83, several kilos of meat, a tub of raspberry ripple ice cream, 24 beers and a bottle of port later and we were ready to start cooking. After quick appetite-building game of football out in the sun, the lads settled down to watch some TV and drink beers whilst I got stuck in with the dirty work. I started off by making my pizza dough, the recipe for which you can find here. When I mentioned the hours of work ahead of us (me) and that I was planning on using tinned tomatoes, the lads gave me an icy stare and started using words like 'amateur' and 'cutting corners'. I don't think their reverse psychology worked on me, but I definitely left that supermarket with an enormous bag of fresh tomatoes. When I first started working in restaurants, it felt like all I ever did was peel tomatoes, so luckily I've got it down to a T. Crisscross on one side with a sharp knife then dunk them in boiling water for 30 seconds to a minute. Drain, stick them in cold water and the skin comes right off. Squelchy. I blitzed these up with some onion, red chilli, bell peppers, garlic, herbs and spices to taste and you've got a delicious, fresh tomato sauce - happy boys? I also put together a white sauce roundabout now...it was all starting to come together, exciting stuff. With everything else out of the way, it was time for the meat. Mince beef, sausage meat, bacon, chicken and chorizo - the pizzagne was going to have it all. I had a hand with the cutting up of the bacon...with all this meat it was definitely going to be a two-man job. We cooked off the mince and the sausage meat in a pan and added the bacon. Nothing special there. At this point it's probably worth saying that I like my food to taste good and to look good, and I consider it a job very well done if I can tick both those boxes. Sometimes, however, you have to forfeit aesthetic beauty for something that just tastes damn good. This is one of those times. Jake has spent a fair amount of time in Spain, so when it came to the chorizo I took a step back and let the man do his thing. He sliced it up, cooked it off in some paprika and port (which, ermm...was exactly what we had intended to do with it) and the result was this rich, delicious, smokey chorizo sausage. Superb. The man's not just a pretty face (and a very pretty face it has to be said). I greased a couple of baking trays and lined them with the dough I made earlier. Standard tomato sauce and two types of cheese then covered one with chicken and the other with Jake's special sausage (wink wink). Bung them in the oven at 200C or so for about 20 minutes or so. Exact science here. For the record, the tinned tomatoes were a failsafe measure to bulk it out! With everything ready, it was time to put it all together. Whilst we pondered about making one, towering pizzagne, sadly the baking trays would not allow for such awesomeness, so we decided to split them into two. Good idea that in the end, as it turns out that pizzagne makes a remarkable hangover sponge, ideal for the morning after the night before. Note the dirty marks on the wall? Tip.Of.The.Iceberg. After a layer of the meaty, tomatoey goodness, followed by lasagne sheets and white sauce, we plopped the pizzas on top and began to repeat the process. Things were smelling pretty fantastic, we were in the home stretch! ...and from the side it might look like a very sloppy lasagne. But that added layer of doughy, meaty, cheesy pizza was just unbelievable. Every mouthful was bursting with all of the flavours that you would want and expect from such an immense combination of dishes, and I think we all agreed that it was a success, and then some. See, I told you he was pretty. And yes he is very pretty - where did you get him from? I could do with one for my sister! who is the little girl in the last photo? does she come with the dish?